Nutrition plays a huge role in overall health. Rather than sporadic dieting, the key to healthy nutrition is establishing lifelong patterns. Healthy eating patterns over a lifetime contribute to the development of all body systems. Choosing nutritious foods and drinks and cutting out detrimental options on a daily basis create the patterns that will leave you feeling good, week after week, year after year. 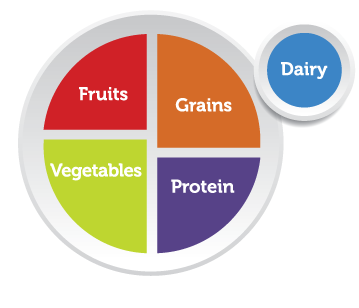 Rather than the old-school food pyramid the USDA now promotes nutrition with a plate graphic. Half the plate at each meal should made up vegetables and fruits. This s a huge increase from the old pyramid. Ideally, whole minimally-cooked fruits and vegetables dominate. The other half of the plate contains proteins and grains, preferably whole grains. Dairy products such as milk, cheese, soy products and yogurt, round out the recommended foods. Water is the preferred beverage, with 8 cups a day the recommended amount. Choosing a variety from each category will give you a wide range of nutrients. What you don’t eat is as important as what you do eat. Limiting sodium, added sugars and saturated fats is part of a healthy eating pattern. Since different vegetables have different nutrients try to select a variety from the different subgroups: dark green, legumes, red & orange, starchy, and other. Legumes include both beans and peas, such as kidney beans, chickpeas, lentils, and edamame. Potatoes, green peas, and corn fall in the starchy veggie subgroup. The ‘other’ category includes green peppers, lettuce, celery, and onions. Focus on whole fruits for the fruit servings. Fruits might be raw, canned, frozen or dried. While fruit juice is part of this category juices are less nutrient dense then whole fruits and often have added sugar, so choose carefully and make juices only a small part of your fruit intake. Grains provide the most nutrients when they are whole. Rice, popcorn and oatmeal are in the grain category as are foods the contain processed grains such as crackers, bread and pasta. Processed grains are missing parts of the kernel and also much of the beneficial iron and fiber. When choosing processed products try to find ones containing enriched grains. Keep an eye out for added sugars and saturated fats. Depending on your preference proteins can come from animal or plant sources, or a combination of the two. Meats, seafood, eggs, nuts and seeds are all sources of protein. Legumes and dairy products are also sources. By focusing on increasing the amount of fruits and vegetables at each meal and limiting salt, added sugar and saturated fat you can overhaul your eating patterns and become healthier.